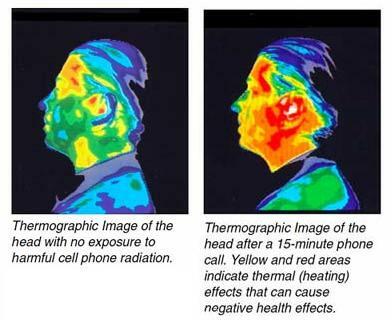 According to an Associated Press article today, A respected international panel of scientists says cellphones are possible cancer-causing agents, putting them in the same category as the pesticide DDT and gasoline engine exhaust. The classification was issued Tuesday in Lyon, France, by the International Agency for Research on Cancer after a review of dozens of published studies. The agency is an arm of the World Health Organization and its assessment now goes to WHO and national health agencies for possible guidance on cellphone use. The same cancer research agency who conducted the study also lists night shift work as a probable carcinogen. For some strange reason, the cellphone industry trade group, CTIA—The Wireless Association, was not convinced. In their response, they pointed to two US agencies that have found no evidence cellphones are linked to cancer—the Food and Drug Administration and the Federal Communications Commission. 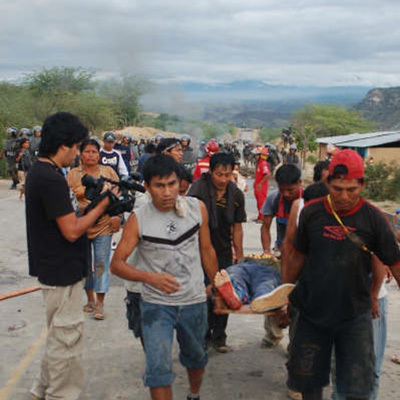 For the past three weeks, more than 10,000 Indigenous People, mostly Aymaras, have been protesting against the oncoming Santa Ana silver mine in southeastern Peru near the border with Bolivia. The Indigenous people are concerned that pollution from the new mine would threaten their livelihoods and contaminate local rivers and lakes. For those reasons, the protesters want to see the Peruvian government revoke the mining license it granted to the company behind the mining project, Canada’s Bear Creek Mining Corporation. The protesters are also calling for a definite ban on all mining in the region. The massive protest, for which the Aymara and some Quechua have set up a sequence of blockades along a 300km stretch of road on both sides of border, was facing a media blackout until this past weekend. 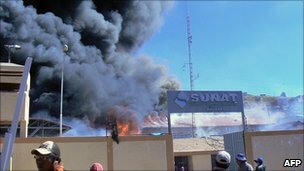 On May 27, a number of government buildings in the Peruvian border town of Puno were looted and set ablaze. That seemed to give the media what they needed; however, the organizers of the protests are insisting that they aren’t responsible for the violent lash out. Rather, they say, it was brought on by individuals who have infiltrated the protests. In hand with the lack of media coverage, the police and military presence throughout the protest has been almost non-existent. On May 28, Reuters reported that President Garcia has indeed authorized the military to “maintain order”, but so far they haven’t tried do so. That’s partly because of the sheer scale of the protest; but moreso because of the upcoming presidential election in Peru, which is set for June 5. According to Reuters, Garcia has stated that he won’t give the order to stop the protests until after the election concludes. At least one is reported dead in Peru’s southern region of Puno after the National Police fired on protesters April 26, the second day of a 48-hour civil strike or paro called by campesino groups to demand a halt to local mining and petroleum leases. The deceased, identified as María Choque Limache, 61, died after inhaling tear gas as police broke up a protest at the village of Yohoroco, in Huacullani district of Chucuito province, according to Walter Aduviri Calisaya, president of the Puno Front for the Defense of Natural Resources. National Police commander Jaime Cordero Ayala denied this version of events, insisting she had not been at the protest and had died of natural causes. Most recently, on May 29, the protesters rejected a deal to stand down in exchange for a 12-month moratorium on mining. Negotiators for the protesters initially agreed with the offer, but the protesters themselves said they won’t settle for anything less than a definitive ban on mining which must be ratified through a presidential decree. A Brazilian environmentalist was killed Friday in the Amazon Rainforest region, three days after the murders of two other environmental activists in the area, authorities said. Adelino Ramos, known as Dinho and a leader among local impoverished farmers, was killed Friday morning while selling vegetables produced in the farming settlement in Porto Velho in the state of Rondonia. He was shot six times by an unidentified man on a motorbike. Reports said Ramos was receiving threats for denouncing illegal logging in the Amazon region along the border between Rondonia and the states of Acre and Amazonas. He also fought for land reforms in the region. To read a full write-up in the Huffington Post, click here. Thousands of angry indigenous protesters have taken over the city centre of Puno in south-eastern Peru. Looters have taken advantage of the unrest and ransacked offices and shops as the police retreated. Cars and buildings were torched on Thursday night when protesters went on the rampage, demanding an end to a Canadian silver mining project. The indigenous Aymara activists say the mining company will pollute their ancestral lands. The protesters have blocked the main roads into the city. A customs office was set ablaze on Friday and several other buildings are still smouldering after being torched in the night. The demonstrators have threatened to continue the disruption until the government revokes the mining concessions for the Canadian Bear Creek mining company. The activists say the mining corporation will contaminate nearby Lake Titicaca, decimating the fish stocks. However, the firm denies it will harm the environment and wants to begin production next year. The unrest in Puno comes two weeks before the 5 June presidential run-off election. The indigenous activists say they will try to stop the polls from going ahead in Puno if their demands have not been met. On the morning of Friday, May 6th President Mauricio Funes of El Salvador’s left-wing FMLN party, arrived at the La Maroma agricultural cooperative in the department of Usulután for a potentially historic meeting with hundreds of small family farmers. Usulután has often been referred to as the country’s bread basket for its fertile soil and capacity for agricultural production, making it one of the most strategic and violent battleground zones during El Salvador’s twelve year civil war between the US-supported government and the FMLN guerrilla movement. Once again, Usulután has entered the spotlight for its agricultural reputation. The FMLN, which initially formed around an ideology of national liberation from US hegemony, has now adopted the goal of “food sovereignty,” the idea that countries hold the right to define their own agricultural policies, rather than being subject to the whims of international market forces. On Friday, officials representing the Ministry of Agriculture and the local governorship accompanied President Funes in inaugurating a new plan aimed at reactivating the country’s historically ignored rural economy and reversing El Salvador’s growing dependence on imported grains. The opening ceremony for the new plan was hosted by the Mangrove Association, a non-governmental organization established by members of a grassroots social movement called La Coordinadora del Bajo Lempa y Bahia de Jiquilisco (known locally as La Coordinadora), which has been supporting initiatives for food security and environmental sustainability in Usulután for over 15 years. Over the last three months, the Ministry of Agriculture has been working closely with the Mangrove Association and other campesino organizations to develop what may represent the new program’s greatest break from past governments’ agricultural policies: a goal that by 2014 all corn and bean seed needed for agriculture be produced by Salvadoran farmers, rather than purchased from multinational seed companies, namely Monsanto, as has been the case in recent years. An Amazon environmental activist and his wife were killed late on Monday and the crime is being investigated as a possible assassination to silence the outspoken forest defender, according to police. 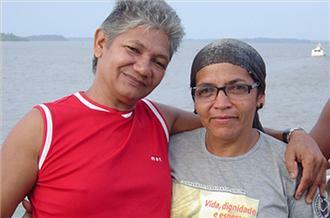 José Claudio Ribeiro da Silva, also known by his nickname of “Ze Claudio,” was shot and killed along with his wife, Maria do Espírito Santo da Silva, in Nova Ipixuna, a rural town of 15,000 people in the northeast Brazilian Amazon state of Para, about 40km from the nearest city, Maraba. Exact details and circumstances of the death are not yet clear. However, Felicio Pontes a federal prosecutor in Para state, as well as Marcos Augusto Cruz, the local civil police investigator, told Al Jazeera by phone late on Tuesday that the killings have all the signs of a cold-blooded murder for hire. “We are working on a hypothesis that this was an execution because the shooters cut off one ear of each of the victims,” Cruz told Al Jazeera. “Usually this is done as proof to give back to whoever ordered the killings,” Cruz told Al Jazeera, before adding that is was likely he was killed in retaliation for speaking out against illegal loggers. Ribeiro was a community leader of a rural Amazon sustainable reserve that produces nuts and natural oils native to the forest. But as loggers moved into Para state, Ribeiro increased his candid denouncements of illegal clear cutting in the region, which earned him praise from environmentalists but allegedly scorn from logging and business interests who hold enormous influence in the heavily deforested region. Heads up for upcoming documentary If a Tree Falls: A Story of the Earth Liberation Front, about the controversial environmental group. The film is directed by Academy Award Nominated filmmaker Marshall Curry (RACING DREAMS and STREET FIGHT) and focuses on the evolution of the group and the transformation and radicalization of one of its members, Daniel McGowan. The documentary will open in New York on June 22nd with a national rollout to follow. Please feel free to post this on your site.